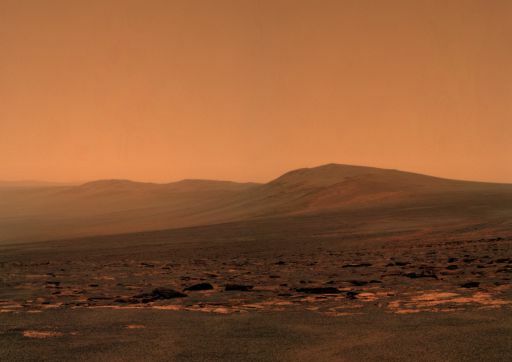 The two rovers, Spirit and Opportunity, have taken many panoramic pictures of the Martian landscapes they've traversed, but I think that this is one of the loveliest. (To see it full-size, check out the entry in the Planetary Society's blog, where I found it; a variation on the same scene can be found here.) It's a view taken by Opportunity two days ago, looking across the western foothills of the rim of Endeavour Crater, and it's lovely for two reasons. The first, for those who have been following the progress of the rovers since they landed on Mars more than seven years ago, is that this is the end of a small but epic journey of some 21 kilometres that began in 2008, after Opportunity left Victoria Crater. All that time, driving backwards because one of her front wheels is jammed, the rover has traversed a landscape of rippled sand and exposed plates of rock, interrupted by the occasional smashed dish of a small crater. Twenty-one kilometres - 13 miles - doesn't sound much. A good afternoon's ramble. 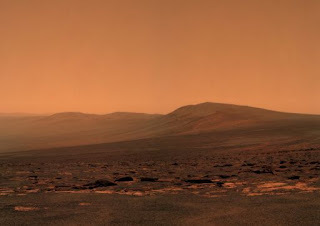 But Opportunity is no bigger than a golf cart, is long past her warranty date (she was supposed to operate for only 90 Martian days, or sols), is being steered by remote control by operators on Earth, and the terrain, while it has been mapped and photographed by orbiting spacecraft, contains unknown perils and traps. While Opportunity was travelling, her sister rover, Spirit, became inextricably stuck in a patch of loose sand, and succumbed to the Martian winter after operating as a stationary science platform for more than a year. Opportunity ploughed on, backwards. At sol 2681 she finally reached Spirit Point, named after her sister rover and at the edge of a ridge known as Cape York. Now she's ready to begin the science part of her fifth mission extension. Endeavour Crater is some 22 kilometres across, much bigger than Victoria Crater. The rock layers exposed by the impact that created it are deeper and older, and there are signs that some of the layers are clay-bearing phyllosilicates formed in the presence of water. But the other reason it's an especially lovely view is that it is in many ways quite Earth-like. The ridges may mark the edge of an impact crater (and the rocks in the foreground were thrown from another much small impact crater beyond the right-hand side of the photomosaic), but they have been eroded into soft shapes by millions of years of wind-blown sand, and they are also softened by the hazy atmosphere, giving a very familiar effect of a landscape fading into the distance. Alien and familiar, they wouldn't look out of place in an Earthly desert. It's very easy to imagine standing there, and walking forward into the unknown.